The holidays are upon us, and with it so much to do, and so much frenzy… And when you think your plate is already full you learn that you need to adjust your schedule to add a few more things to your already full agenda;-) My daughter announced on Monday morning that she had a concert that same night. Of course I was not going to miss it, but that meant lots of juggling in order to be there. The concert was an array of Holiday Songs so it was very relaxing. I thoroughly enjoyed it until we got home and it was dinner time:-) What was for dinner?!?! it was 8:30 by the time we got home so no real time to cook anything for the kids. They were going to have left-over lasagnas. Me, a quick trip to the Fresh Market and I would be set. I was going to buy some fish of course. 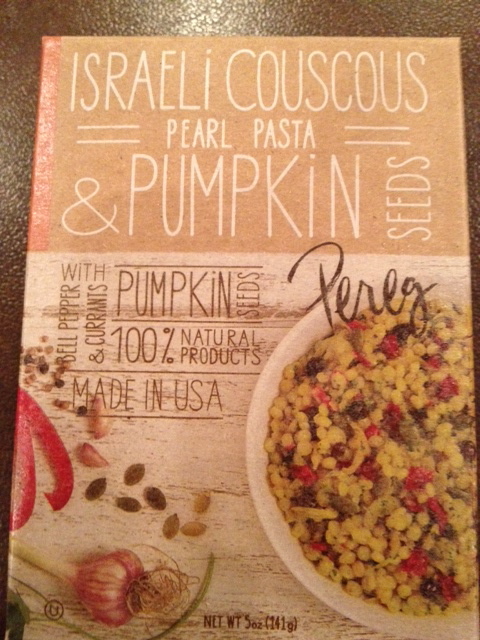 As I was looking at the window, I saw a box of “Israelli Couscous & Pumpkin Seeds”. That really stroke my interest and decided to that it would be fun to try, with…???? with Shrimps. 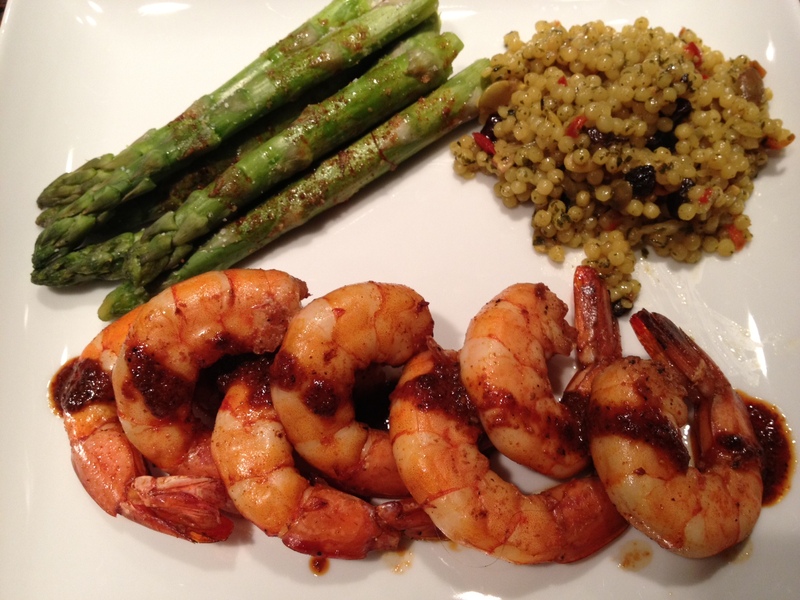 Ingredients for 2 persons: 10 jumbo shrimps (uncooked, peeled but with the tail still on), 2 tbsp of sherry wine, 1 tbsp of pumpkin oil, 2 tbsp of light soy sauce, 1/4 tsp of paprika, 1/16 tsp of pepper. Place all the ingredients above and mix well. Use half of the mixture to marinade the shrimps and keep the other half for drizzling over later. 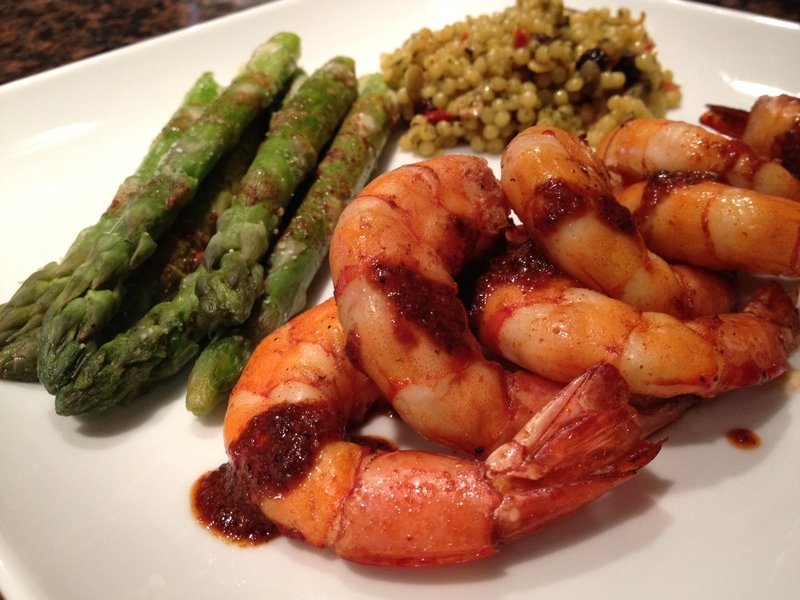 You want to marinade the shrimps for a few hours ( they will absorb the marinade and taste better). When you are ready to eat. Place the shrimps on a silpat and cook in oven at 375 for 7 minutes. Meanwhile empty the content of the israeli couscous in a large round mold, place 1 3/4 cup of water, 1/3 tsp of salt, 1 tbsp of butter. Place the octogonal silpat over the round mold and microwave for 10 -12 minutes. The couscous should be soft. 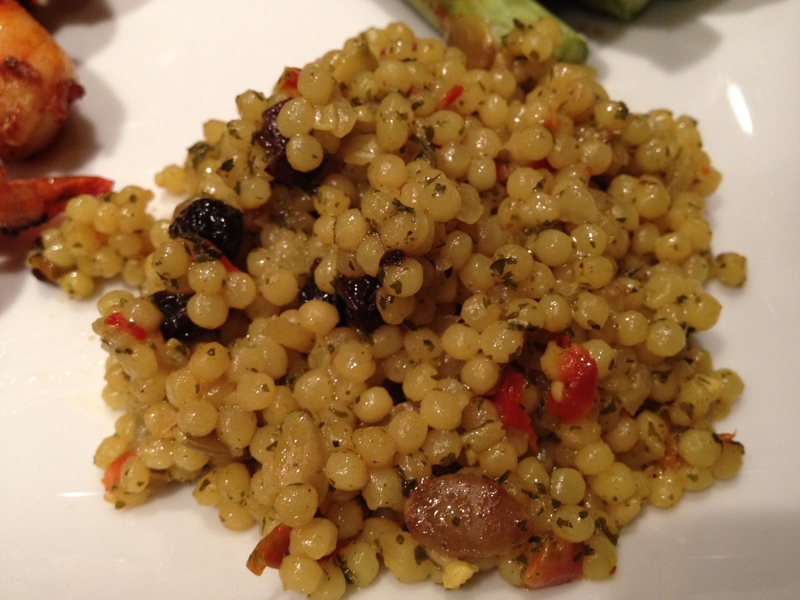 Fluff the couscous up with a fork. In a small saucepan, place the other half of the marinade and bring to boil. When it is hot, drizzle over the shrimps. To serve, place the shrimps on the plate, drizzle the sauce over it. Spoon a few tablespoons of the couscous and some roasted asparagus. Et voila! Your meal sounds good. I wouldn’t have thought to bake shrimp on a Silpat. Thanks for the tip.